I went to the gym 4 times this week, which is more than I went in the previous 3 months, so now I consider myself an expert on gym motivation. This week I have 5 tips to make going to the gym a little easier. Seriously, these are gems! 1. Wear a bikini to the beach when you are not bikini ready. The horror you feel will be all the motivation you need to make it to the gym. 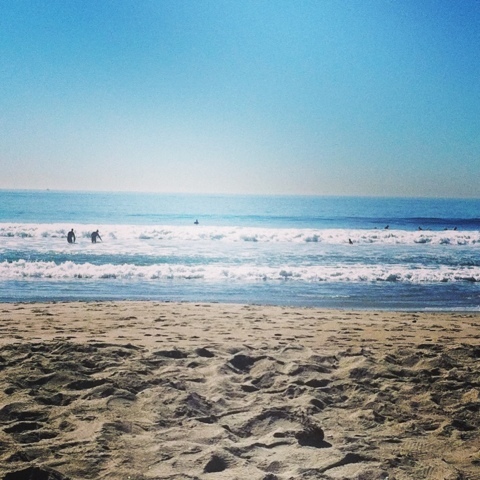 Okay, so I didn’t have the lady-balls to actually go to the beach in a bikini. I looked in the mirror, cried a little and changed into a tankini and shorts. 2. Schedule your workouts during your favorite TV shows. 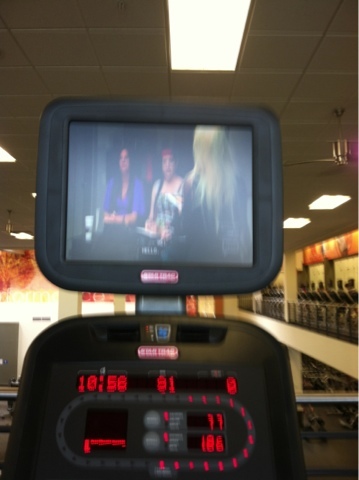 I always stay on the elliptical a little bit longer when I those Real Housewives are in a cat fight. Sorry so blurry, but its hard to run and photograph. 3. Keep a mental note of how many calories you burned at the gym. It makes us a lot easier to put that chocolate cream pie back on the shelf when you see its 410 calories a slice. 4. 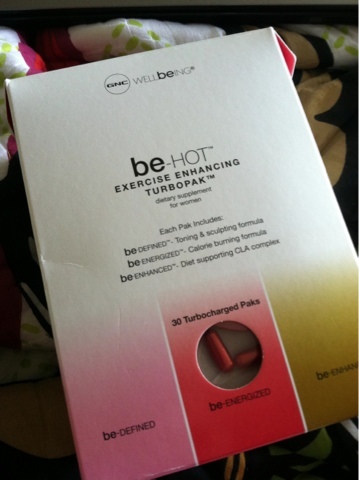 Do yourself a favor and go to GNC and get the Be Hot Turbopaks. They are awesome! Seriously my workouts go to another level when I use them. I am all about putting in the time to get the body I want, but I also believe in working smarter rather than harder. 5. Reward your hard work. Set a goal and when you reach it, go get yourself a cute new Lulu Lemon top or a massage. I’ve got my eye on this! Plus we’re giving away $25 to Lulu below. Don’t forget to link up! Hello lovelies! It’s time for week two of The Biggest Loser: Blogger Edition, brought to you by Ashley, Chelsea and Jenn! Our version of The Biggest Loser is a little different than the one you see on TV! In Blogger Edition, no one gets kicked off, and we aren’t just trying to lose weight. Instead we are creating a place to go when you need a little motivation, when you need to voice your frustration, when you are looking for a healthy recipe, when you are looking for a new workout to try. This is the healthiest link-up on the net! So link up with your health goals, your struggles and your triumphs. Tell us about why it’s been hard to lose the weight, why health and fitness is important for you or what you’ve learned. Share your favorite healthy recipe from the week, the fitness fad you are loving and the triumphs you’ve overcome. Then visit all the other ladies who’ve linked! leave them some love and together we will create a community of support. This is the year you will meet your health and fitness goals and we’re going to help you get there! PLUS each week you link up, you have a chance to win something fabulous from one of our sponsors! So grab a button, link up and enjoy! This week you can win $25 to Lulu Lemon! Want to sponsor The Biggest Loser: Blogger Edition? Email us! Great tips! When I'm in the gym I definitely get in front of a tv with something i want to watch so that ill stay longer! i find this is especially helpful when Biggest Loser is on! lol! It always helps me to meet a friend there AND (as lame as it sounds) to have cute workout clothes! I downloaded this app called Nike Training Club (NTC) available on Droid or Apple products and it seriously is amazing. Your New, Handheld Personal Trainer, seriously. Great for the gym or home. Love your tips. For me its good (sometimes a little raunchy) music, fresh air, and just wanting top be strong, for, and healthy. Good luck to everyone in the comp. I love the idea of rewarding yourself with new work out clothes! The sight of new lulu threads into drawer get me motivated because I look forward to wearing them!